Udforsk landskabet omkring Franz Josef-gletscheren og New Zealands forrevne vestkyst på en 2-timers ATV-tur fra Franz Josef-landsbyen. Tag i bjergene og regnskoven i de sydlige Alper, mens du går offroad og følg stier skåret af gamle gletschere stier i ørkenen. Din guide fører dig gennem regnskoven, flodbredder, græsarealer og mudder på en spændende tur, der omfatter brug af ATV-udstyr og vådt vejrudstyr. This trip was too rough to enjoy. The entire road/track was full of ruts, rocks and bumps making it difficult for my passenger to stay on and to keep up with the guide Nevada, who despite being told we couldn't keep up or even see the track she was taking, didnt slow down or look back for us.I was disappointed and couldnt wait for it to end. We biked through bush, across farmland, across and through the river. Stopped halfway for photos and a chat. Informative and interesting commentary. Having not quad biked before, it was good to try something new. Unfortunately there was an overcharge with Viator, but Quad Bikes fixed it straight away. Just make sure you are not paying for passengers if it's only you riding. The quad bikes are a buzz! The whole tour was excellent, riding along the river and through temperate rain forest. It is no longer possible to walk up to the glacier for a look, only helicopter access. 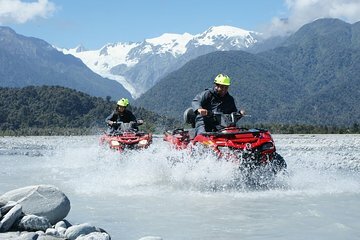 The quad bike tour is a great alternative to get a good look at the Franz Josef glacier, with limited time. Highly recommend this as an experience. The guides are very safety conscious, and good training is provided at the start of the ride to make sure that you are confident to handle the bikes. The bikes are well-maintained, good wet weather gear is provided.